Membrane Press Adhesive, is new generation adhesive for fixing PVC, PP, PET, ABS onto especially MDF by the vacuum or membrane press process for the manufacture of high gloss furniture in kitchen, bathroom or wardrobe shutters and doors. 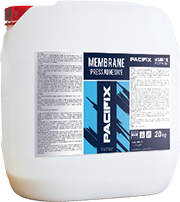 Membrane Press Adhesives are can be used together with Akfix hardeners creating a cross linked film with high adhesion properties and very good heat and water resistance. Easy to apply, has a low viscosity. Synthetic and natural materials, excellent bonding. Low and high temperatures do not lose strength. Heat-sensitive film with high adhesion for the low activation temperature. Not harm the environment and human health. Permanent adhesion for durable fixation.